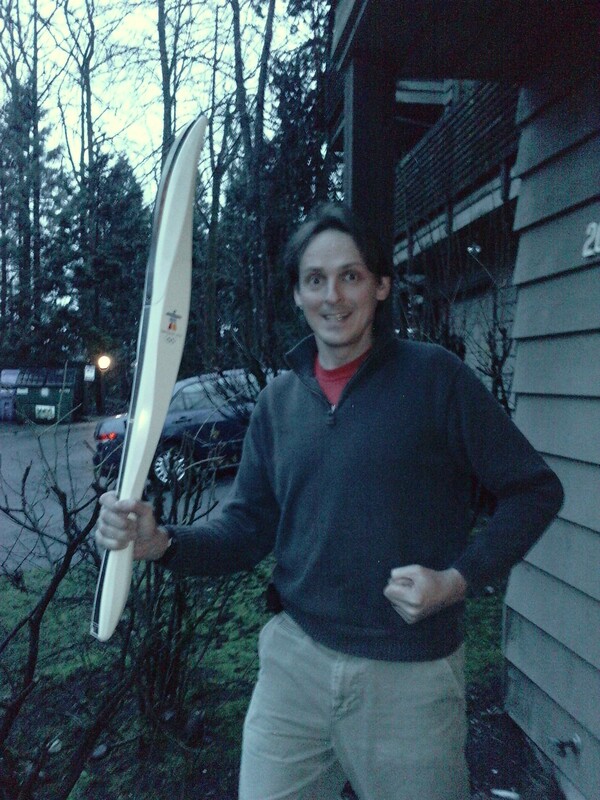 Olympics | Damian Trasler's Secret Blog - Do Not Read! I’ve spent a lot of today fighting the feeling that I’ve missed out. 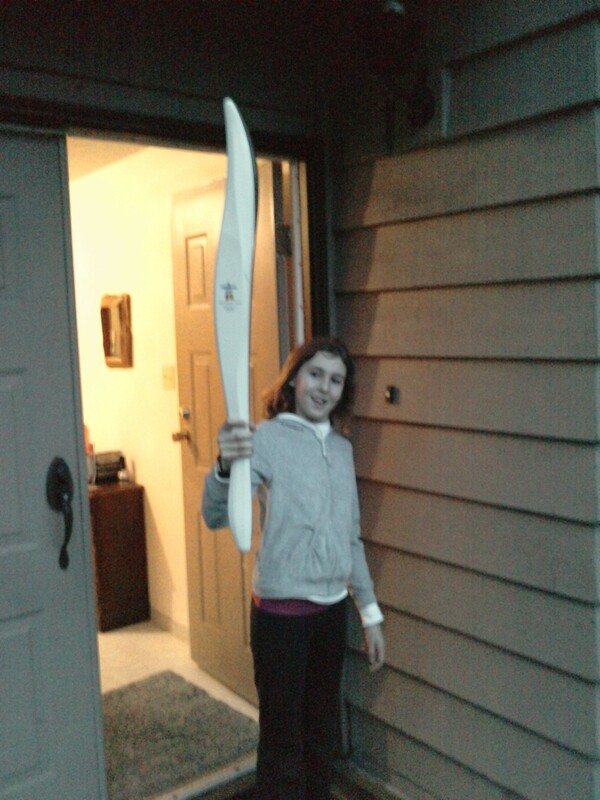 Here we are in Vancouver for the Winter Olympic Games, and I didn’t see any of it live. That’s fair enough, tickets were as easy to find as Rocking Horse poo, but I also didn’t take the time to go Downtown and feel the atmosphere as everyone got into the Olympic spirit. I was reminded of all this today because it was the Opening Ceremony of the Paralympic Games. We have a stake in this because Eldest Weasel is a member of her school choir and was going to be singing at the ceremony. She went to the rehearsal yesterday and came back bubbling with excitement but unable to tell us anything about the plans because she had been sworn to secrecy. Mrs Dim and I had discussed the event and how to cope with it. You may remember that we sat down as a family and watched the Olympic Opening Ceremony…Well, Mrs Dim and I sat down, the Weasels hopped up and down, had fights, asked if they could play on the Wii, asked what was on the other channel etc etc. It didn’t seem fair to expect the two tinier weasels to sit through the whole ceremony on the promise of getting a glimpse of Big Sister way off in the distance. It would mean a long night, and we’d be getting home very late, so I volunteered to stay home with them, record the live coverage (and watch it, obviously) and Mrs Dim would get a ticket and attend in person. It turns out we were lucky to get our ticket early, because demand has been high. Vancouver has missed the Games in the last few days, and the promise of more national pride and Olympic partying has meant tickets for every event are being snapped up. I got several calls from Mrs Dim inside BC place, well ahead of time. She doesn’t deal well with having time on her hands, but she found her way through to where the choirs were waiting and had a hug with Eldest Weasel, giving me a chance to wish her luck over the phone. I rustled up a world-class evening meal (ok, pizza and sliced vegetables….and Cheetos) and the Tiny Weasels and I sat around the coffee table, munching and watching the Ceremony get under way. I was surprised, just like with the last ceremony, which bits they found impressive. Middle Weasel was gasping with delight at the projected flowers that bloomed around the arena as a girl danced to a violin, but was unmoved by the break dancer who couldn’t use his legs. The speeches were a low point for the weasels too, though I was impressed by the Governor General of Canada in her smart purple leather outfit joining in the performance and opening the games with a genuine grin. She really seems to love her job. So the highlight of the evening was always going to be the song “We rise again” sung by Nikki Yanovsky and, crucially, the massed school choirs. When Eldest Weasel first told us about this, she said she was going to be one of four hundred kids singing. When we saw the paperwork, it turned out to be four THOUSAND. The odds of spotting her were not good, especially as the cameramen were far more inerested in Nikki. But amazingly, on the first shot of the choir, there she was. It took a couple of seconds to spot her, and the shot was only four seconds long, but even Tiniest Weasel managed to focus and recognise her before the shot changed. This is something of a minor miracle, for the child who couldn’t see the Angel of the North as we drove by it. So I couldn’t tell you the name of the lad who lit the cauldron, or anything else that happened after we saw Eldest Weasel. It was a good show, definitely enough to show that the Paralympics are not the poorer sibling these days, but a major sporting event in their own right. Perhaps the day when they take place simultaneously with the Olympics is getting closer. Two tired weasels have brushed their teeth and gone to bed, and I’m considering diving back into reviewing some plays before I have to bring Eldest Weasel back from her school rendezvous point. Did I really miss out? No. I’m here, in Vancouver, when it’s all happening. Hearing the cheer go up when Canada won the gold in Hockey a few days ago, it didn’t matter that I was on the shop floor and not in Robson Square. If we were still in the UK, I wouldn’t have given a second thought to the Winter Games, so the previous weeks, and the weeks to come, are a pleasant surprise. Tomorrow I’m working through the whole day, so I expect my smile muscles will cramp, but at least I’ll learn where some more items are around the store. If you need anything for your home improvement, drop in and say hello. Yesterday was big deal for Canadians. 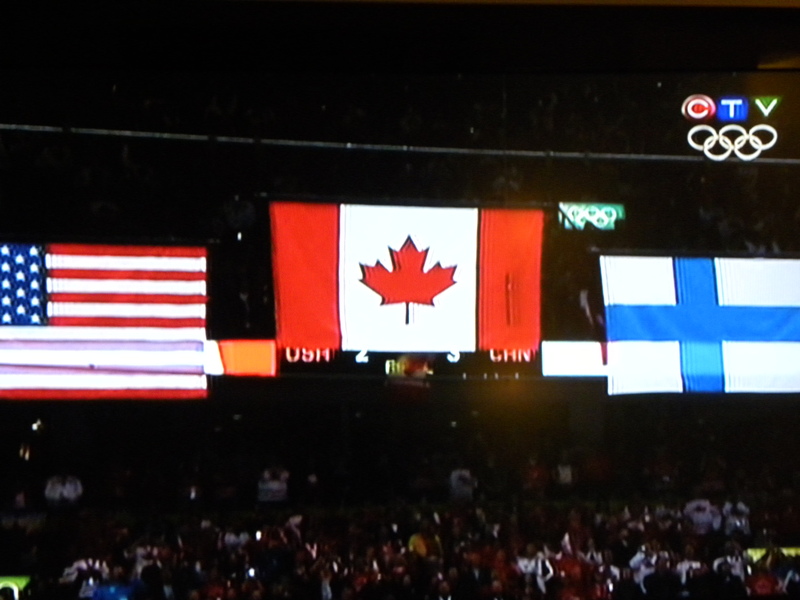 It was the big rematch of the Winter Games, the Gold Medal Hockey tussle between the US and Canada. It seemed to be the only topic of conversation for a lot of people. I caught the beginning of the game before I had to leave for work, and the Canadians were ahead by two goals to one when I left. I made it into work to find the TV on in the Break Room and folks glued to it. I had to be down on the shop floor, so I wandered away. Somewhere there was a radio piping commentary of the match into the shop, but Hockey Commentary is a mystery to me, since the game moves so fast and I didn’t know which players were on which team (shocking, I know, but give me a chance, we’ve only been here a year!) Still, co-workers were always passing by and happy to give news of the progress of the game. “What did I tell you, Andy? Canada WIN! 3-2” Cheers from all around the store, customers and workers alike. Almost immediately the place began to fill up. The place had been almost deserted during play, but now the game was done people flocked in. Almost all of them were grinning. The first few were eager either to tell me the result of the match, or find it out from me. We had folks wearing flags, with maple leaf face paint, Canada jackets, T-shirts, hats… One lady said she’d been in CostCo when the match was won and the place went mad. I couldn’t work out why CostCo in particular, but then I remembered they have a huge display of big-screen TVs. Where better to watch the match? I was sorry to miss the closing ceremony, but got home to find Mrs Dim had recorded it for me. I had been surprised by how brilliant the opening ceremony had been, and regretted not recording that, so I’m looking forward to watching this one later. People are starting to wonder what we’re all going to do now the Olympics have happened. Are we going to go into a post-apocolympic slump? But that’s not really fair. In a few days, on March 12th we get the Paralympics, and if you thought the struggle of the athletes in the regular games was inspiring, you ain’t seen nothing yet. I shall be watching the opening ceremony (and recording it) because Eldest Weasel is one of the schoolchildren who’ll be singing with Nikki Yanovsky, and I spent a good deal of today wrestling with the ticketing system to try and get a ticket for Mrs Dim to attend in person. No joy so far, but I think it’s churlish to complain about something like that when the events themselves will feature people who have overcome far more. I will not be defeated by beaureacracy…though the spelling may give me pause. So Week Two of Work has begun, and it’s going well. The times are fitting in nicely with Educating Weasels and Mrs Dim’s schedule, and I’m getting enough writing done to feel like I’m not writing to support my new career in retail. (Oh, my new play! It’s going SO WELL. Of course, I’ve had to halve the length and revise my grand plans, but it’s GOING SO WELL! Don’t tell anyone, though. It’s easily startled.) I still don’t have my schedule for the week after next, so I don’t know if my shifts will line up with my elephants and allow me to go on holiday. Now we’re into March time is moving even faster. There’s only a handful of days before Spring Break, only a few more to the holiday and once we’re back from that it’s packing and moving. Tomorrow I’ll pile into the redirection business again. Seems weird, trying to remember what it’s like to be unpacking boxes – this house has been sorted for a while now. We even stopped changing the pictures around, so maybe we got those right at last. Must be time to move. Sometimes, when you’re young, you do something that goes in a direction you’re not expecting. Like when you’re explaining how you’re going to ride this tray down the stairs, and you just put your foot on it, to show it slides and…WHOOOSH! You’re rocketing down the stairs, nearly balanced on one foot and suddenly very concerned about how you’re going to stop. That, in metaphorical terms, was this weekend. It was always going to be busy. Tiniest Weasel was turning six, and we had a party planned. That was scheduled for Sunday, the day of her birthday (and, coincidentally, Valentine’s Day). Saturday was going to consist of light shopping, healthy walks and generally recovering from watching the Olympic Opening Ceremony the night before. So the first part of Saturday went well, with slow starts for everyone, phone calls made and Mrs Dim and Eldest Weasel hitting the shops before lunch. But then things started to slide a little, because we decided to visit a couple of houses. We’re in the market for a new house, after all, so when we saw these two properties were available for viewing, it made sense. Loading up the weasels and Moose, we zipped over to the first one, planning to catch the second one immediately after and then go for a walk on the Mountain. The first house was a bust, being too small and too expensive, although it was in a nice location. The second one was further away, but much more reasonably priced. It was old too, by Canadian standards, maybe as old as seventy years. The refurbishing had done a great job of the entrace floor and the upstairs, but the basement was still bveing worked on. That, and the odd visible sign that woodwork outside needed replacing, seemed to put off a lot of the viewers. I liked it, and Mrs Dim was looking thoughtful The layout inside is odd, but that’s the way the current owners did things, it doesn’t mean you have to keep it that way. So we talked it over as we drove on to the Mountain. 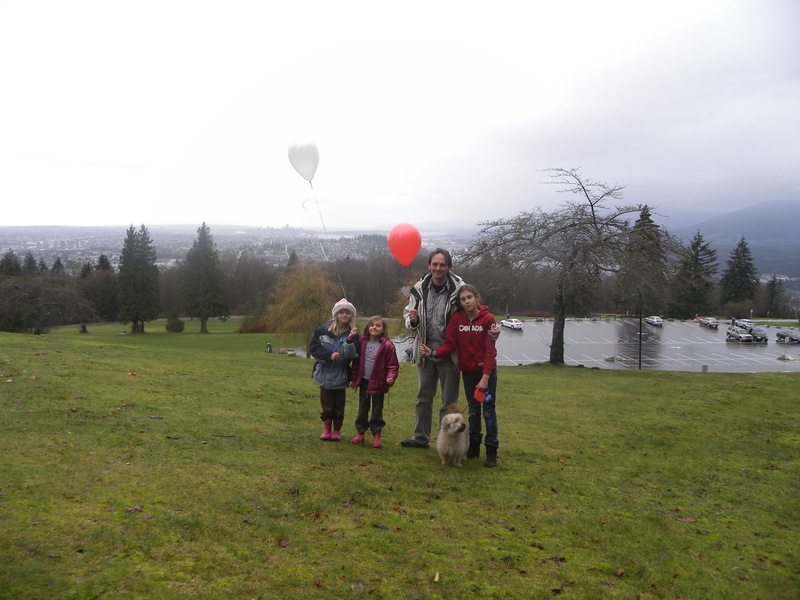 We were there to release a balloon for our friend Candy’s daughter Tali, a beautiful girl who had sadly died just a few days before. Candy and her friends were releasing their balloons in the UK on THEIR Saturday, and though we couldn’t be there, we wanted to take part in spirit. Middle Weasel also wanted to release a balloon for Nodar Kumaritashvili, the Luge Competitior who died on Friday. As we released the balloons, she said she hoped Tali would be happy in heaven and that Nodar could continue his career. Sometimes kids can give you some much-needed perspective on the important things in life, even when they’re tiny weasels the rest of the time. When we got back we called our Realtor, Frank. We haven’t been a lot of use to him, setting such vague parameters for our ideal house that it was difficult for him to pin anything down. Now we had a solid prospect for him, he became a dynamo. Within minutes, we were agreeing to arrange a building survey for the following morning. I changed into my tux, because we were going out to a Murder Mystery Evening across the street, and Mrs Dim made phone calls. We arrived a bit late, and I had to make a few more calls during the evening (missing at least one vital clue. I accused Mrs Dim of the murder anyway. She seems the type. Trained killer, you know.) By the time we got back to our own house, we were on for a busy Sunday. Tiny Weasel came with me in my car to collect a couple of friends on the way to the party, while Mrs Dim took the other weasels direct to the party location to install the cake and check the arrangements (because I made them, and could therefore have booked the wrong place, the wrong month or for eighty kids instead of eight. These are, so it seems, important details to get right.) Once I’d delivered my set of partygoers and made sure the other parents were happy to stay with Mrs Dim, I hopped back in the car and zipped over to the Prospective House (trying not to think of it as the New House yet…) to meet the Building Inspector and Frank. The news was pretty good, at least in the verbal report, with a lot of work that COULD be done, but nothing so pressing it would prevent anyone living in the place while they did the jobs. I brought Frank back to the Rental House and we met Mrs Dim and the Weasels, then talked House-y business for a while. First time I’ve made lunch for a Realtor… By the time Frank left, we’d decided to put an offer in on the house. We’d signed papers. Putting an offer in on a house we hadn’t even seen 36 hours before. Crazy? Not as crazy as the speed of real estate over here. Before the weasels were in their pyjamas we’d heard back from the owners. We were the only people making an offer. Did we want to change our offer at all? We did, and minutes later we had the verbal assurance that we had the house. In under forty eight hours we had gone from viewing to owning. Now, don’t ask me about completion, title deeds, mortgage arrangements and so on. That’s all by-the-by. Important, oh yes, but by-the-by for now. We have a great house, a new hobby (fixing stuff, mending stuff, painting stuff…) and a packed schedule for at least the next three months. In the next post I’ll talk about the Elephants Theory of Time Management, but for now, I have to go, my head is spinning again. Ok, I got a job….Now what? So, that went well. Interview number three, that is. I actually got to feel like a genuine, caring parent, because I made sure Moose got walked before the school run and drove the Weasels to school so I could read to Tiniest Weasel in “Parent Reading Time”. Having rushed through “The Cat in the Hat” (I love the classics) I leapt back in the car and made it to the prospective employment zone in time to meet the Store Manager. Now, as a point of policy (and not to bore people beyond belief) I’m not going to write about the people or the place where I work unless A: They give me explicit permission to do so or B: It becomes clear that no one there knows or cares about this blog. Since B seems to be the prevailing attitude of the entire world, you may get to hear about it all anyway. But not today. So tonight, I won’t be celebrating getting a job. Yes, I’m pleased, it’s a relief and the start of a new phase of life (again!). I’ve noticed how much more I’ve got done in the last few days when I thought I was losing all the time I’ve had at my disposal since we arrived, and I hope I can maintain that momentum when the pace really does pick up. But tonight we’re gathering together as a family and watching the opening ceremony, with popcorn, hot dogs and probably ice cream too. It feels like there’s a great big party here in our adopted hometown and whether there’s any snow up those mountains or not, the world is looking at Vancouver and it would be churlish not to smile and wave. 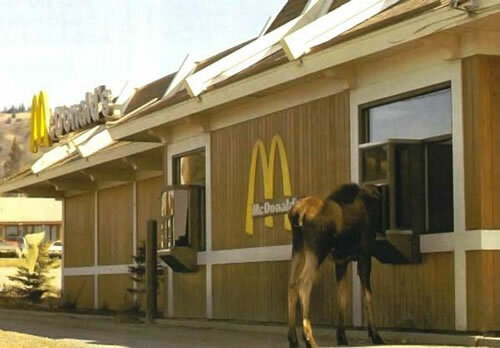 Well, it would be un-Canadian. *I realise that this may not be the correct name for the event. 1 It’s ugly. OK, not Downtown, which is full of achingly beautiful soaring skyscrapers and historical buildings, or the sweeping majesty of Canada Place, built to reflect the sails of the thousands of ships that sailed into port here. But outside the beating heart of Downtown, you’ll find roads lined with urban sprawl, strip malls, big boxy shops and warehouses. The key is to lift your eyes, now and then, and glimpse the mountains that line the horizon wherever you go. 2 People really are that nice. You may think this is some sort of effort laid on for the Olympics, but you have to remember these people are Canadians. If they see you looking lost or worried, they’ll ask you if you need help. Total strangers are happy to help you with the complexities of travel on the SkyTrain. Let them – this isn’t the Tube. 3 It’s really this clean all the time. I’m sure there are people who’ve been asked to tidy up especially for the Olympics, but it won’t need a concerted effort to make the place look smart, because generally speaking the city is a clean place. People put their trash in the garbage, to use the local terminology. And if you put your hand on a piece on gum on the SkyTrain, I’ll bet one of the visitors put it there. 4 No matter what you might have heard, pot is still illegal in British Columbia. You won’t find it being handed out for free on the streets. Smoke it in public, or try to buy or sell it and you WILL be arrested. OK, you MIGHT be arrested… if the officer doesn’t have anything better to do. 5 You can only buy alcohol in a Liquor Store. It can be annoying, if you’re doing your weekly food shopping and then have to go to an entirely different shop to buy a bottle of wine and some beer, but make the effort. BC wines are worth trying, and the Granville Island beers are terrific. Just don’t try drinking any of them in a public place. The cop that can’t be bothered to arrest you for smoking pot might suddenly get all conscientious and arrest you for public drinking instead. Then bust you for the pot you have in your pocket. 6 The Outdoors is more important than the Indoors. Sure, people like their houses to be nice, and they spend plenty of time and money in The Home Depot (the world’s largest Home Improvement Retailer) but they call it “Super, Natural British Columbia” for a reason. That might explain the ugliness in point 1, because everyone’s too busy skiing, cycling, walking the miles of trails and watching the wildlife to worry about town planning and the state of their front yard. 7 People like being Canadian – if you’re here for the Olympics, you may be impressed by the support for Team Canada, but the odds are those flags are up all year round. All those special clothes in red and white, with Canada on the front? We all had them already. Even our deckchairs have maple leaves on them. If it stands still long enough, someone will put a maple leaf on it. It’s not a “We’re better than you” kind of thing, everyone’s just so happy to be Canadian, they want the world to know. 8 When we say “multicultural society” we really mean it. Canadians come in all skin tones, sizes and accents, so don’t make assumptions based on the way someone talks. You’ll know they’re Canadian – there’ll be a maple leaf on something they’re wearing if you look hard enough. It’s best not to bring your assumptions at all – that beardie weirdie guy strolling along the pavement towards you wearing scruffy jeans, sneakers and a hoodie may not be homeless; he could be a businessman, a father, or a college graduate. Casual is the ONLY way to dress over here. So, dress how you like and no one will complain (this guarantee does not cover your spouse or children). 9 Food. This may be North America, but don’t believe that you are condemned to a choice between a famous burger chain or a famous fried chicken franchise. If you understood point 8 about the multicultural society, then you’ll understand there’s a whole world of food to choose from, usually on the same street. It’s all great, all fresh, usually reasonably priced, and the restaurant staff are just thrilled to meet you. 10 There’s no snow. OK, this may not be a huge surprise, since I hear the news has mentioned it a couple of times. But really, Vancouver is not an icy wasteland populated by lumberjacks and Mounties. We’ve got a temperate climate not unlike that of the UK, with a stunning range of cultural pioneers, pushing the boundaries of art, theatre, film and music for more than one hundred years. So you are more likely to get rained on than snowed in. Do what the Vancouverites do; wear a light fleece and a tee shirt, put up with the damp and never carry an umbrella.